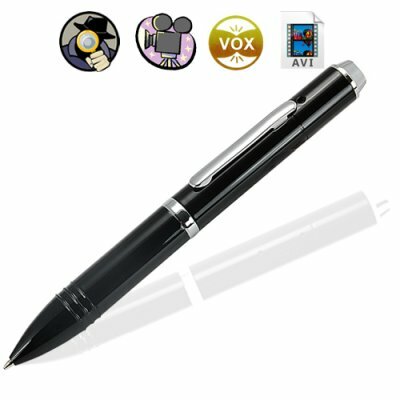 Successfully Added 8GB Digital Pen with Image Capture and Video Recording to your Shopping Cart. Write and in style with this surveillance gadget that has both video recording and image capture. Built with the highest quality internal micro-chip components, the CVMV-I36 Digital Pen with Image Capture and Video Recording allows for straight to AVI recording at a higher resolution than most pens on the market today. This digital pocket video recorder is beautifully presented and framed with a classy, gloss black exterior. Designed to look and work as a fully-functioning business pen, it is actually a DV camera for recording motion video or to capture still photographs of unsuspecting people. This model also comes with auto sound detection that records audio and video. With its deceptively normal exterior, this is the perfect blend of modern technology and conventional stationery for all aspiring secret agents. Easy to use and practical, this is an elegant and compact pen designed with portability in mind so it fits unobtrusively anywhere. This Pen would be perfect for those working within business, education, HR, security, media, press relations, tourism and many other areas. This is a truly flexible and desirable item that can be used by anybody, anywhere! Place it on your desk, on a shelf, or in your shirt pocket - it is the perfect covert device. Designed to encompass a massive spacious capacity of 8GB flash memory, that lets you record hours of business meetings or interesting events on the sly. This amazing pen can also be used as a standard USB memory stick to conveniently transport your important computer files. The CVMA-I36 is in stock now for your single piece or stock orders and is available exclusively from the number one wholesale source for surveillance cameras, Chinavasion. Very nice design gadget, writes great. This device is a lot more than spycam. It is also a camera for static photography, a USB drive, a sound recorder, a webcam, and of course a pen. The quality of the video is very nice HD. See http://www.youtube.com/watch?v=lYiS_9llVT8 for some footage I took at a local supermarket with the pen in the pocket of my jacket. I recently purchased this spy pen and really satisfied with it! For the money, it is more than worth the price. I was hesitant to order at first because the price is sooo low compared to the others sites but I had to try. I am amazed when I received it within three days from ordering it, that's including the weekend days! DHL is awesome. Great product for the money and satisfied with the delivery. Despite of all the negative comments from the Internet, you guys did a good job on my order! Ok when I first read these reviews I thought a lot of them were made up or bogus. I have tried a number of different spycams from multiple vendors. This one clearly has the best quality of them all. If you want it to remain undetected, a tiny square of electrical tape blends in perfectly to cover the led record light. I went to a shop where I wanted a closer look at some of the products, they didn't allow photography, so I took the pen with me. It did a fabulous job of capturing the products so I was able to review them again when I was at home. The light compensation is one of the best I have ever seen. The only downside to this product is the 1 hour battery life. I solved this problem by purchasing a second pen :) Now when one hits the 1 hour limit, I simply plug in my portable usb battery charger to it, and switch to the other pen while it charges. The pen holds 8gb of data, which allows you to record again once you are done charging, without downloading the data to your computer first! How awesome is that. But seriously if you're looking for a spycam pen, get this one, you will NOT be disappointed. The instructions could use a better translation, but overall, just playing with it for a few days will give you the feel of how it works. Another Excellent product. I will continue to use Chinavision from now on. Just received the item i order (Car diagonistic tool and 8GB spy pen), this are lovely product and many thanks to chinavasion for the free gift of booklight, its just nice of you guys, keep it up!!! Just received this pen together with a solar charger and two way radio that I ordered and I would like to thank Chinavasion for an awesome free gift(solar keychain).